It’s almost artichoke season. These lovely veggies are at their peak in early spring, from March through May. While the majority of the artichokes grown in the U.S. are found in California, gardeners in almost all climate zones can successfully harvest these plants with a little planning. For more on how to plant artichokes, check out this great tutorial. We may be getting a little ahead of ourselves, but we’re craving this springtime treat right now. 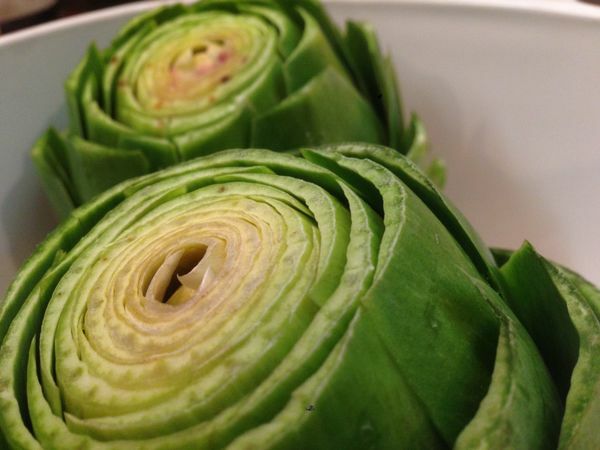 Artichokes our easy to incorporate into a variety of simple and elaborate dishes. An easy option is steaming your artichokes and coating them with a lemon-butter sauce as in this recipe. If you want to show off the distinct flavor of artichoke in an unlikely manner, our favorite artichoke recipe is a winner. Today we thought we’d share it with the Humble Gardener community: spinach fettuccine with fresh artichokes and sun-dried tomatoes. First of all, we can’t get enough of spinach fettuccine. If you’ve got fresh spinach on your hands, make it yourself with this amazing and simple recipe. Then put that fresh pasta to good use with 3 artichokes and a few other natural, yummy ingredients. This is the ultimate garden-inspired main course perfect for a family dinner or get-together with friends. File it away for next month and keep your eyes on the prize: spring is almost in sight! 1. In a large griddle, heat olive oil over medium heat. 2. Add onions and cook until tender. 3. Next, add in artichokes, garlic, lemon juice, salt and pepper and allow mixture to cook until artichokes are tender, about 8 minutes. 4. Pour in wine and simmer until just thickened. Add 1/4 cup pasta water set aside, the tomatoes and thyme. 5. Add pasta, salt and pepper and toss well. 6. Transfer fettuccine to bowls, grate with Parmesan on top and enjoy!